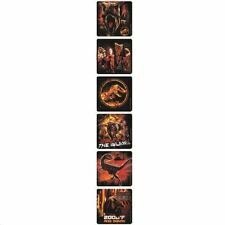 Panini Jurassic World (fallen Kingdom) Empty Sticker Album. 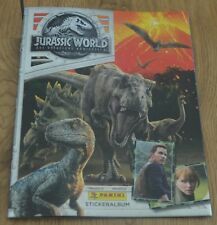 PANINI JURASSIC WORLD FALLEN KINGDOM STICKERS full sealed box 50 packets RRP £35. Condition is New and sealed check out my other items I’m happy to combine postage Please note some of the boxes may have slight damage this does not affect the contents. 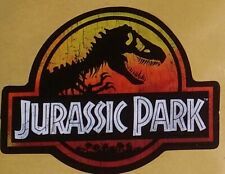 Panini - Jurassic World - Fallen Kingdom Stickers - Job Lot 178. The book was successful, as was Steven Spielberg's 1993 film adaptation, which led to four sequels, although only the first two films were based on the novels. Individual stickers unused. £1.25 for five stickers. 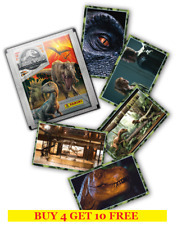 PANINI JURASSIC WORLD STICKER ALBUM 2015 - COMPLETE SET & POSTER. Condition is Used. Dispatched with Royal Mail 2nd Class. Completed album and poster. Please note this was completed by an older child so the stickers may not be 100% straight. The middle page is a little loose in staples. No rips or tears. Completed then stored away. 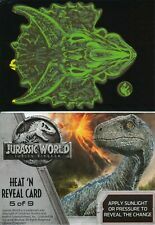 Jurassic World (2015) 3D Lenticular Sticker Cards (X1 to X8). This is the complete set in mint condition - Very rare. Shermans Jurassic World 2 Fallen Kingdom Stickers. PUBLISHED / RELEASED BY ' PANINI ' in 2015. A COLLECTIBLE COMPLETE ALBUM SET OF STICKERS MADE IN ASSOCIATION WITH THE MOVIE RELEASE. THE ALBUM / COMIC GRADE WOULD BE ; FINE ! A RARE COMPLETE SET WITH OVER 150 DIFFERENT STICKERS STUCK WITHIN IT which is in GOOD / VERY GOOD all-round condition. HAND DRAWN ORIGINAL SKETCH CARD. JURASSIC WORLD. FALLEN KINGDOM. We also buy trading card collections. Film Card Set of 39. Add to Favourites. One sticker album included. Country : United Kingdom. JURASSIC WORLD. 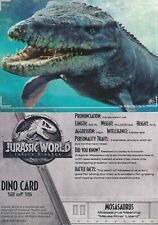 "Dino Card" 15 Card Chase Set. FALLEN KINGDOM. We also buy trading card collections. Add to Favourites. I have duplicate stickers from my son's book. Selling at 10p a sticker. Send me a best offer with total price for the stickers. Postage fees to be added on. Stickers i have are; 3 .. 5.. 10(x2).. 11.. 12(x2).. 19(x2).. 20.. 21(x2).. 25.. 34(x2).. 40.. 45(x2).. 46.. 62.. 66.. 67(x2).. 76(x4).. 78(x2).. 79.. 85.. 87.. 88.. 91(x2).. 97.. 107(x2).. 115(x2).. 119.. 121(x2).. 122.. 123.. 124.. 133(x2).. 141.. 149.. 155.. x2.. Condition is New. Loose stickers for the Jurassic World Fallen Kingdom sticker album. Stickers currently available are. Album contains 41 sticker including 2 lenticular stickers and 1 glow in the dark sticker. 11(2), 19,25(2),26, 30ab(2),32,34,37(3),38, 44(4),45,46(3),47,52(3),53(2),57(3),58(3),59(4),67,69,78(2),96(2),97(2),98(2),102,107(2),109(2),117,119(2),121(3),122(3),123,124(3),126(2),133(2),141(3),142(3),144(3),155(4),156 Choose any 7 stickers when auctions end and sent me message. Triceratops coin which came from Tetley tea, still in the original cardboard packaging. Ive had this from new in my collection but I am condensing down my belongings and this is one thing that needs to go. Its from 1997, which I believe coincides with the original release of 'The Lost World' Jurassic Park film it is advertising. Coin has never been removed from its packaging. Cardboard case is in very good condition aside from the unfortunate glue remnants on the back from where it was originally attached - I think it would have been to the tea box but I cant recall for sure. From a smoke and pet free home.